The green bean is crunchy and delicious. A wonderful warm salad or a side to most protein dishes. A roast chicken, duck, roast beef or a rack of lamb? It can be served at room temperature or warm. Lightly toasted Pecan or Walnuts takes it up a notch. Shave some Parmesan cheese over to complete as a salad. Alternately add crumbled feta or goat cheese to this. I even like adding dried cranberries or fresh pomegranate seeds for that burst of colours and flavours to pop!! It takes minutes to prepare and not too much work is involved. 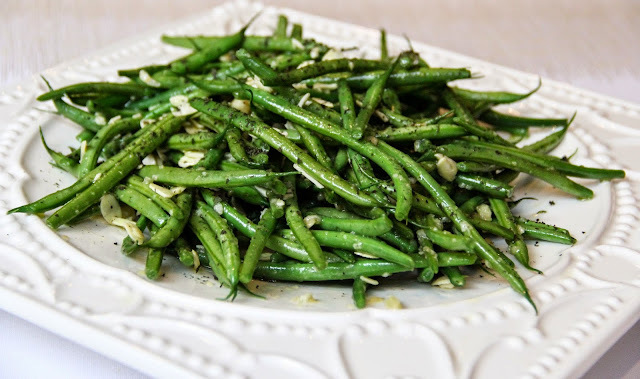 Tossed green beans with garlic and olive oil. In a pan gently heat 1 tbsp of the oil, do not over heat. Toss all the beans into the pan, sprinkle with salt and and sugar. The colour of the green beans will change as you keep tossing. Once it is shiny all over, add the chopped garlic and the rest of the olive oil, Sprinkle with crushed dry mint, cover the pan. Lower the heat and allow to cook for 5 minutes. This will allow it to cook through. Check for the crispness to desired texture. Toss into your dish and sprinkle with sumac. Serve. These are thin green beans, or very young french beans. Use them whole. I like to keep the top and tail. You may cut both if you prefer. Initially cook on a high flame. It can be served at room temperature or warm. Add lightly toasted Pecan or Walnuts. Shave some Parmesan cheese over to complete as a salad. Alternately add crumbled feta or goat cheese to this. Sprinkle dry cranberries or fresh pomegranate seeds for the burst of colour and flavour. You can substitute finely chopped fresh parsley, mint or corriander leaves for the dried mint. Instead of sumac you can sprinkle it with freshly cracked pepper. I even often make them by adding a mix of crushed fried onions, garlic and bacon-bits (not prepackaged) with a touch of maple syrup. Labels: Fresh garlic and green beans.